I am astounded by the number of types of yogurt for sale at the market. There are all kinds, Icelandic, Greek, Russian, Bulgarian, flavored and unflavored; but I have tried very few of them. Ever since I started making yogurt almost four years ago, I shop for milk instead. I've settled on Saint Benoit, organic Jersey whole milk, which makes a lovely yogurt with great texture and flavor. If you're interested in reading about (or listening to a story about) the process behind commercial yogurt making, NPR did a piece on it in 2015. 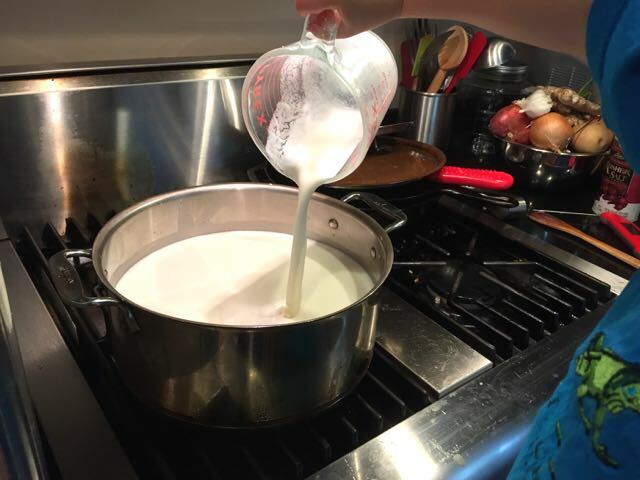 Homemade yogurt is different from commercial yogurt. When you make yogurt at home, you can achieve a tastier and much more active product than what you buy at the store. My basic process for making yogurt has always been to heat two quarts of milk to about 185 degrees Fahrenheit, cool the milk to about 117 degrees, mix in three tablespoons of yogurt from my previous batch (the first time I made it, I used Saint Benoit plain yogurt that I had purchased--amazingly, the culture was so strong that I haven't ever had to buy another starter) and then pour the mixture into a container with a lid. 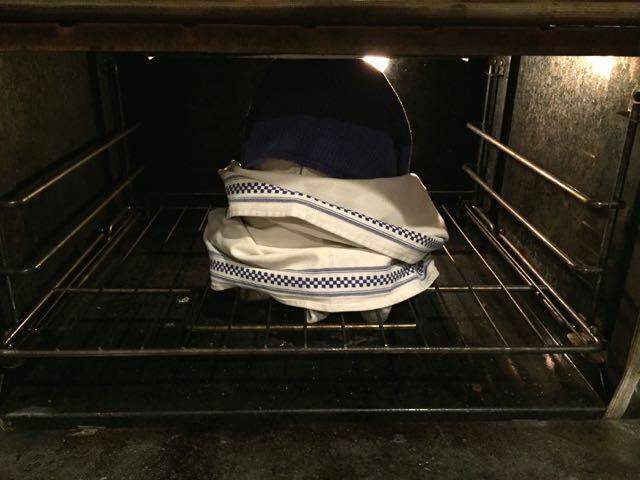 I wrap the container in dish towels, turn on the light in the oven, and incubate the yogurt in the oven overnight. I have had a few yogurt mishaps. It seems like they mostly happened when I tried to incubate yogurt during the day. Two or three times, I turned the oven on, and about 15 minutes later, I wondered why the kitchen smelled like someone had been ironing. And then there was the time when I forgot about the yogurt, turned the oven on to 425 degrees, eventually smelled scorching cotton, and I freaked out. I moved way too hastily, slopping almost all of the yogurt out of the covered casserole dish and onto the inside of the oven and oven door, and all over the floor. The yogurt dripped everywhere, including between the panes of the oven door window, where I couldn't clean. I had to call our favorite appliance repair shop, Otto's Appliance Service, because I couldn't dismantle the door myself. As Otto remarked to me good naturedly, once he had the door on the floor and in pieces, "You could have bought a lot of yogurt for this service call." He wasn't wrong. Since that incident, I bought a big Fido jar that seals nicely, and I have gotten much better about remembering when the yogurt is in the oven. For the last couple of years, I have had my yogurt process dialed-in. But recently, when it was time to make more yogurt, I remembered that David Asher's The Art of Natural Cheesemaking includes a section on making yogurt. Earlier, I had breezed by that chapter because I was already making yogurt. This time, I read it. David insists that the person making the yogurt must pay attention to the milk during the entire heating and cooling process. That means 30-60 minutes of constant stirring of the milk at 185 degrees, and constant stirring during the cooling period, as well. I groaned inwardly at the thought of stirring milk for over an hour. My approach had always been to reach the target temperature as quickly as I could without scorching the milk, then leave the milk to cool down on its own, checking the temperature every 15 or 20 minutes. Sure I'd get a skin on the milk, but whatever. Right? I wondered what a difference an hour or more of active time on yogurt would make. The first night I tried David's technique, I explained to Marc what I was doing. Marc shook his head and said, "Why would you do this to yourself?" Good question. But my bigger concern was that we'd prefer this more time-intensive yogurt. I was right to worry. David's approach to making yogurt* results in a far superior product. The texture is creamier, the flavor is well-balanced, and less whey seems to separate from the yogurt once it has been in the refrigerator for a few days. In fact, the yogurt tastes so much better than the yogurt I used to make that I have gotten in the habit of saving some favorite podcasts for while I stand and stir for over an hour every two weeks or so. Yogurt making is not an activity that I can do with Wyatt at this point. After a couple of minutes of stirring, like any reasonable person, he's ready for both of us to move on to something more exciting. He does, however, love to "wake the yogurt up" when it's done culturing by opening the oven door, removing the kitchen towels and pulling the giant jar out so he can eat fresh yogurt for breakfast. Am I being ridiculous to spend so much time making yogurt? Maybe. Or maybe not. It's really good yogurt. And in my defense (if I need one) I'll note that even I have limits. I have consciously decided not to try cooking the milk for more than 30 minutes. The range David suggests is 30-60 minutes of stirring at 185 degrees, and the longer the milk cooks, the thicker the yogurt will be. Because there is a pretty good chance we will love the longer-stirred yogurt even more, I'm not going there. A large pot, spoon or spatula, thermometer, glass jar(s) with lid(s), towels, oven or warm place for incubation. Take 3 tablespoons of your yogurt starter out of the refrigerator and put it on the counter so it can come to room temperature. Heat two liters of milk over medium heat, stirring occasionally, until it reaches 185 degrees Fahrenheit. Set a timer for 30 minutes, start stirring, and don't stop stirring. Keep checking that the temperature of the milk is 185 degrees. Raise or lower the heat of the burner as needed to maintain 185 degrees. After 30 minutes, remove the pot of milk from the heat and keep stirring. Check the temperature occasionally and when it hits 117 degrees or so, stir in the 3 tablespoons of yogurt. Pour the milk and yogurt mixture into the jar(s) you will be using to ferment the yogurt. Close the containers and wrap kitchen towels around them to keep them warm. Place the jars in a warm spot (like an oven that is off but has the light on). I usually let the yogurt ferment for 10 hours or so. Wake your yogurt up in the morning, just in time for breakfast. *David makes his yogurt with kefir culture. 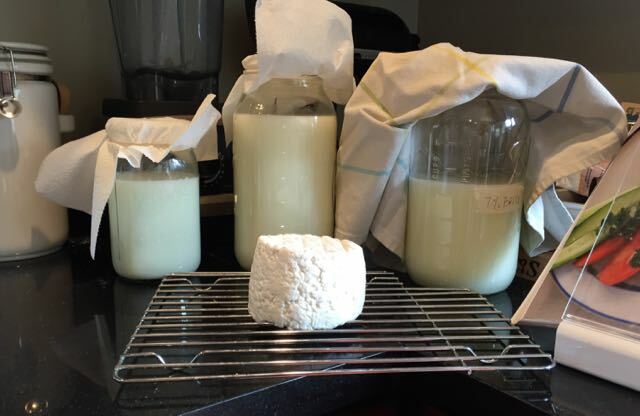 I'm happy with our yogurt culture, so I haven't switched to making kefir based yogurt. "Mom. Does everyone in this family have a Christmas list? Or just me? You really should ask for a chef's hat that way we can be chefs together." 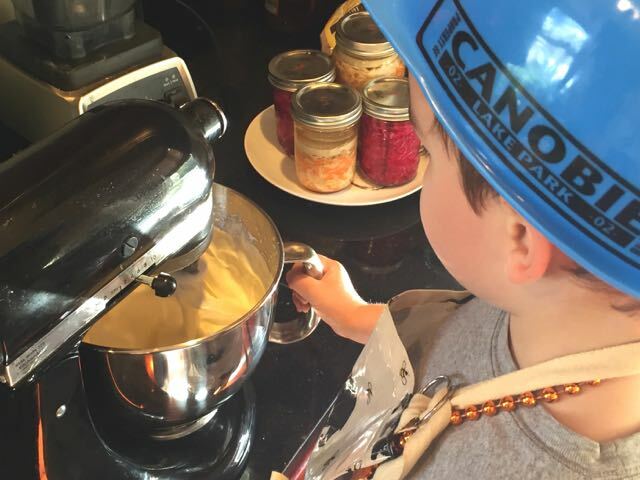 On Saturday, we began testing Dave Arnold's ideas about improving our maple butter. As he explained on the podcast, the problem with getting maple syrup into butter is one of water. To get the maple syrup into the butter, you have to either replace as much of the water as possible in the cream with maple syrup, or make the maple syrup more of a solid and knead it into the butter. We tried both approaches. 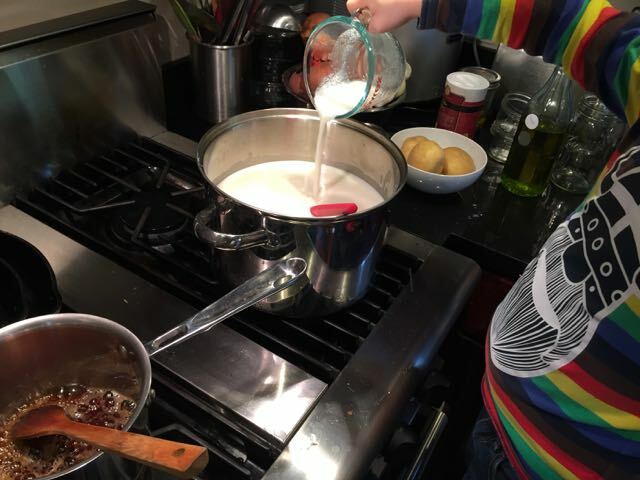 We started with two pints of heavy cream, kefir grains, maple syrup and salt. For the first jar, I cooked two cups of cream on low heat, stirring continuously, until the cream had been reduced to 1 1/2 cups. I stopped there because the cream was starting to look a little grainy and weird, like something irreversible was about to happen. I also reduced 1/2 cup of maple syrup to about 1/4 cup. I stopped cooking it when the temperature reached about 245 degrees. Once again, I stopped because the color appeared to be starting to darken and the smell was starting to change, and it seemed that at any second, there would be no turning back. I let the syrup cool down, and I mixed it into the cream. I then cooled the cream mixture, stirring continuously until the mixture was about 90 degrees. At 90 degrees, I found myself so bored with stirring that I just refrigerated the bowl until the mixture was about room temperature. I added a tablespoon of kefir grains and left the cream to ferment overnight. In retrospect, I probably should have just added a tablespoon or two of active kefir so we wouldn't have had to strain the grains out of the thickened cream the next day. I recall considering this option and then going with the grains themselves for a reason I don't remember. I did not hold back later, though, when tweeting my questions about the health of my mapled kefir grains to Amanda Feifer of Phickle. She confirmed that prepared kefir would have been a better way to go, but assured me all would be well with the grains. She's the best. 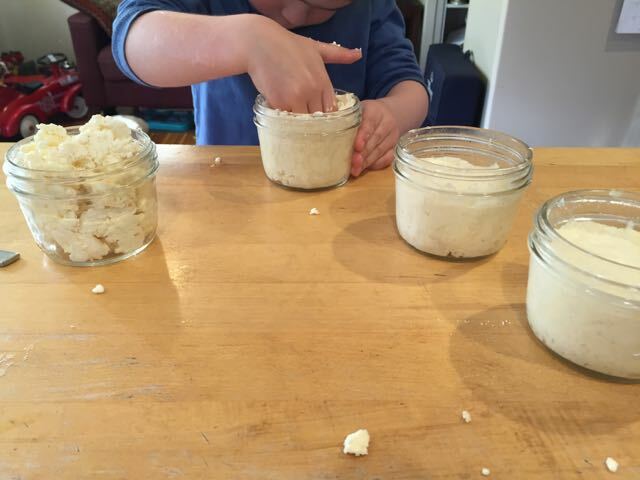 For the second jar, Wyatt poured the pint of cream into the jar, we added a tablespoon of kefir grains, and we left it to ferment overnight. 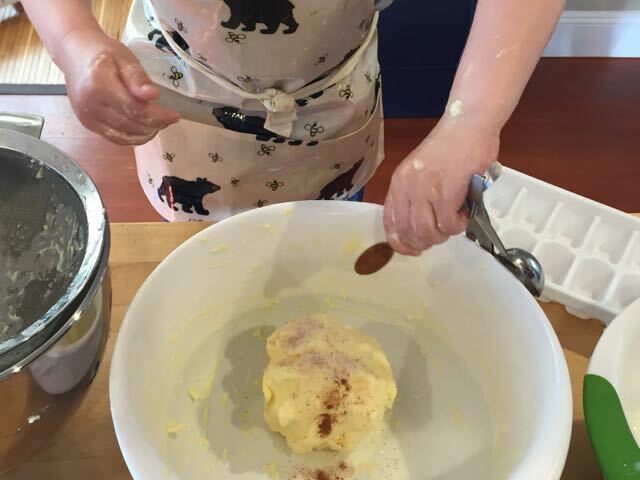 On Sunday, we made the crème fraîche in the two jars into butter. For the first jar, we strained the crème fraîche, whipped it into butter, drained it, rinsed it in cold water, and kneaded in salt. Let me just tell you that the maple-flavored buttermilk that resulted was incredible. Really amazing. 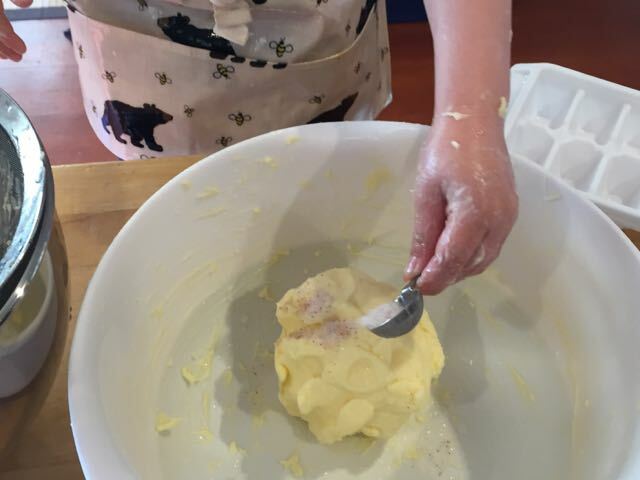 For the second jar, we made the butter the same way. We also made Dave Arnold's recommended "snotty xanthan gel" of maple syrup. 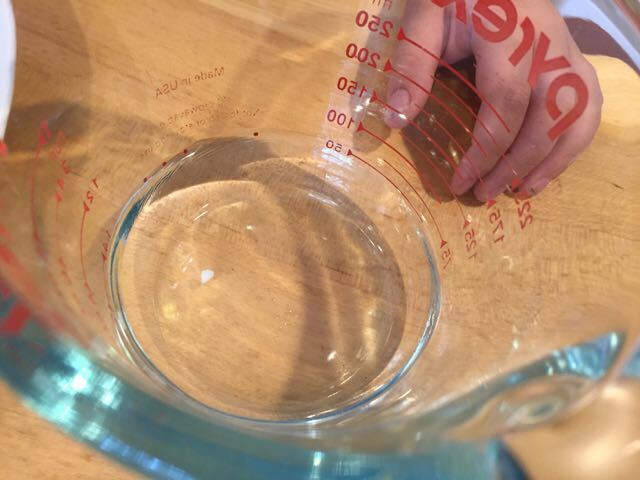 I made a 1% fluid gel by first dispersing the xanthan into water because, from what I had read, maple syrup is about 66% sugar and xanthan doesn't hydrate well in liquid that is more than 60% sugar. As Wyatt said about this preparation, "Try it, Mom! It tastes WAAY better than it looks." The gross-out goo level on butter bits was pretty high, so I actually rinsed the butter bits in cool water in the sieve. Only then was I able to get it all merged back into one ball of butter. Marc was our taste tester. He concluded, "These both taste really good. But maple? I don't know if they taste like maple. They may be circling maple. They taste sweet to me." I think the xanthan preparation resulted in stronger maple flavor, but it was still pretty mild. The cream and syrup reduction preparation was even lighter on the maple flavor. After all, much of the maple flavor ended up in the best buttermilk ever created. While the flavor was more robust in the xanthan preparation, the butter unfortunately ended up with little blobs of maple gum throughout. 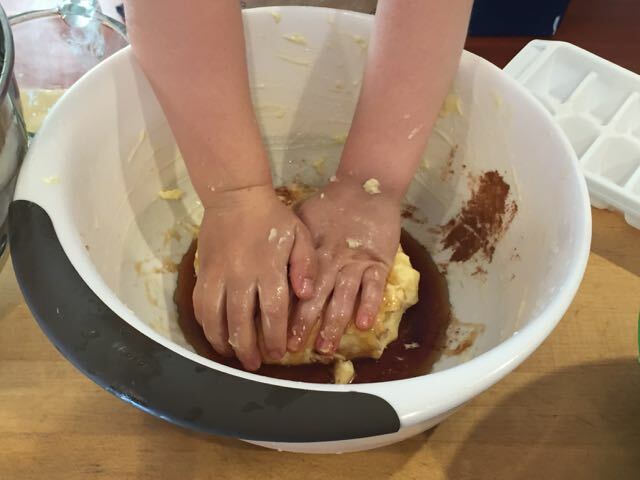 The butter spreads well, but my kneading of that mess was apparently not thorough enough. There is one more idea that we may eventually try: adding maple sugar to the cream before culturing. Maybe that would work. But before we go there, we will need help eating our way out of the current round of butters. "Dad! Guess what? Mom emailed the man who writes the stories about cheese in his book, and you know what? He sent her a knitting pattern to make cheesecloth!" 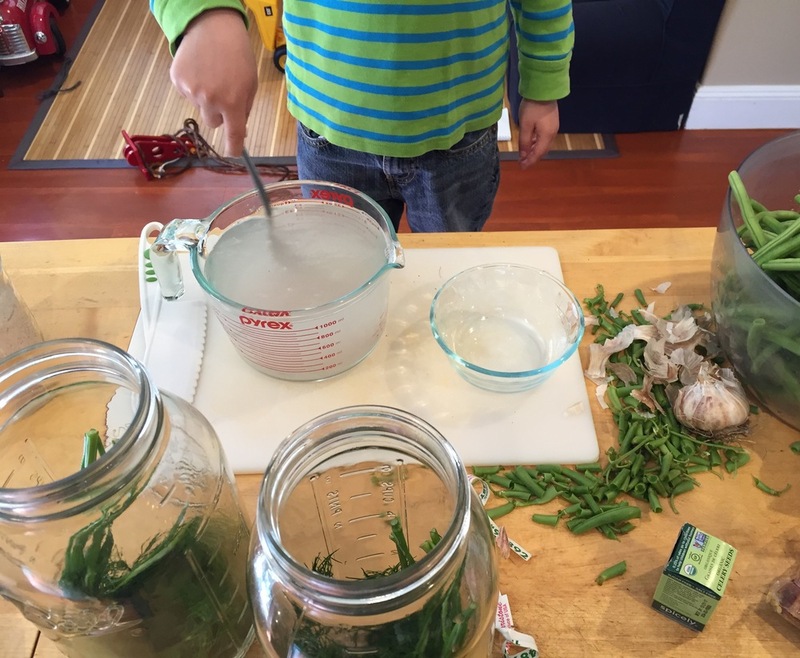 About six weeks ago, while we were cooking dinner, Wyatt said, "Mom. How do you make blue cheese?" I provided a vague description. He quickly exposed my lack of knowledge by asking me "Why?" and "How?" a couple of times, at which point I admitted we'd have to look up how they make it. 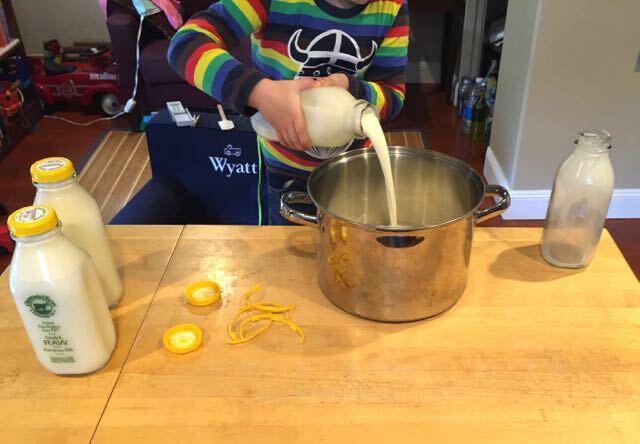 Wyatt then said, "Well, I want to learn how to make cheese." 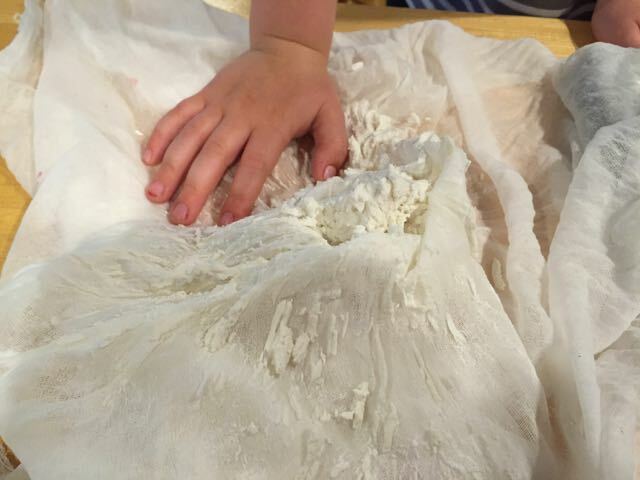 I responded that we had already made it, by making cottage cheese and cream cheese. He gave me a somewhat withering look and said, "I want to make cheese like Andy gives us at Rainbow." It would be amazing to make cheese like Andy gives us at Rainbow. So I asked around about classes for kids (no luck) and started researching cheesemaking books. 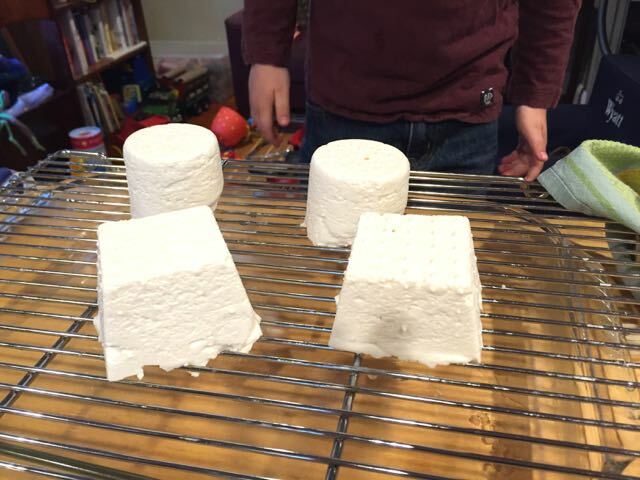 I plan to chronicle [my four-year old son's and my] cheesemaking adventures [on my blog], giving you appropriate credit. I want to support your work, help bring awareness to your approach, and I want you to sell millions of copies of your book. Would you be okay with my writing about what we're doing and how we're doing it...Or what are your thoughts around how you'd prefer I approach this project? [I] was just [at Rainbow] a couple of weeks ago, perusing the cheese selection. And, yes, I can tell you and Wyatt that with good milk, kefir and the right touch you can make cheese just as good if not better than what's in their display! I'd love to see a chronicle of your experiences with the book...Just be sure to acknowledge me and Chelsea Green. And also, take very nice photos to show how good your cheeses look! We've got access to great milk, we keep and use kefir grains already, and we'll look to cultivate the right touch for cheese. Also, I'm all about giving credit where credit is due, and bad food pictures depress me. So I think we are good to go. But there's more! David also loves knitting. He sent me his draft pattern for a knitted du-rag he likes to use for hanging cheese. The pattern uses 500 yards or so of sport linen yarn on size 2 needles, so it will take me awhile. Nevertheless, as I told him, knitting cheesecloth seems infinitely more doable to me than sourcing my own rennet from the fourth stomach of a freshly slaughtered calf (a recipe for which is also included in his book). Pour a pint of cream into a mason jar. Add some kefir grains. Cover the jar loosely with a lid and let it sit in a dark, quiet corner of the kitchen for 24 hours. 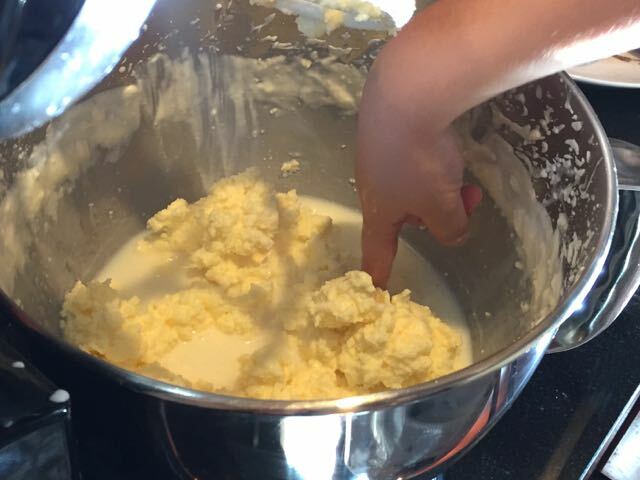 Strain the thickened cream from the kefir grains. Put the cream back into the jar (and taste some along the way). Refrigerate. Eat with fresh blueberry buckle. First, we poured a pint of cream into a mason jar, and then we added some kefir grains. We covered the jar loosely with the lid and put it out of direct sunlight on the kitchen counter. After about a day, we strained the thickened cream from the grains. Easy! Making the blueberry buckle was actually way more difficult than making crème fraîche. As is often the case when it comes to food, Wyatt was right. Crème fraîche, especially homemade, is even better than sour cream. 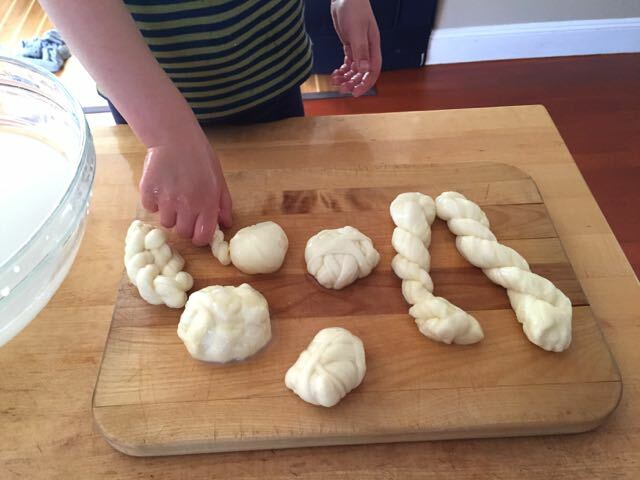 *We make kefir already, and the recipe in David's book is the same as the one we use daily, so we skipped that one.